Today we're all too familiar with the madness of contemporary food diets, with body-conscious celebrities and health nuts mutating the food pyramid into a variety of more bizarre, indescribable shapes. With food fads like Atkins and the Hollywood Cookie Diet on the horizon, it's easy to see how mealtime has, for many, become a strange and uniform ritual. What may be more surprising, however, is the fact that these unorthodox eating habits aren't 21st century phenomenons. In fact, obsessive eating restrictions date back to the days of Henry VIII, meaning the 16th century monarch has more in common with Kate Moss than you'd expect. Photographer Dan Bannino captures the obsessive eating routines of Romantic poets and contemporary supermodels alike in his enticing series "Still Diets." Beyonce's "Master cleanse diet," Lemon Juice, maple syrup, cayenne pepper, salt and laxative herbal tea: don't forget to stock up on toilet paper. Bannino, a self-taught photographer, organizes stunning still lifes that summarize the diet patterns of history's most fastidious eaters. Ranging from stringently healthy to overindulgent, the vast array of diets depict the colorful relationships humans have with their meals, regardless of their era or occupation. To heighten the drama of the artistic endeavor, Bannino snaps his images in the style of 15th century still lifes, adding an air of gravitas to the edible arrangements. "I started this project because I’m fascinated and obsessed by food," Bannino explained in an email to The Huffington Post. "These shoots are showing an open window on a table left after a completion of a meal. As reflected on the series' title, I’ve tried to capture the beauty that lies in this terrible constriction of diets and deprivation, giving them the importance of an old master's painting. I wanted to make them significant, like classic works of arts that are becoming more and more weighty as they grow older. My aim was to show how this weirdness hasn’t changed even since the 15th century." Bannino researched celebrity diets in magazines and online, while gaining stylistic inspiration from scouring galleries and museums. The artist set up his findings in Baroque displays in a self-made studio in his apartment. The entire photographic process took several hours to complete, and, surprisingly, no post-production was required. The resulting images are as visually enticing as they are conceptually baffling. Some, like Bill Clinton's cabbage-centric routine, sound particularly gnarly, while Henry VIII's ultra-extravagant "banquet diet" doesn't seem half bad. Our personal favorite, however, has to be Queen Bey's master cleanse, which comes complete with pink toilet paper to compliment that laxative herbal tea. See the most extreme diets throughout history below and let us know which you'd dare attempt. 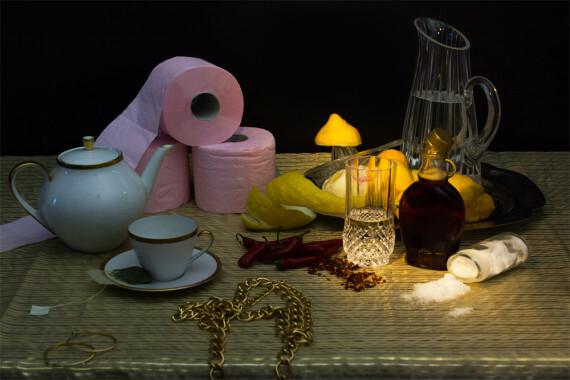 For more food trend-based art, check out Stephanie Gonot's photography. Henry VII, "The banquet diet," Pork, chicken, rabbit and lamb's meat. Fruits and wine (water was consider unhealthy). Gwyneth Paltrow, "Strict detox diet," Vegetables like carrots, broccoli, onions, chickpeas, lentils and almonds. Patè made with nuts and lentils, room temperature water with lemon and/or green tea. Saatchi, "The egg diet" - Nine eggs in all the possible shapes, a glass of wine and a small tank with a shark - his well known lost shark. Kate Moss, "Hollywood diet," Alcohol and cigarettes. Simon Cowell, "Life enhancing," Big box full of exotic fruits shipped via airfreight, which he uses to make fresh smoothies everyday: pineapples, strawberries, grapes, cranberries, blueberries, oranges, mangos, avocados, etc. Big tank of milk, which he uses to bathe in, and vitamin drops. Lord Byron, "Romantic poet's diet," Potatoes drenched in vinegar, poetry and soda water.